Biopiracy has been a part of human history for centuries. Columbus is rumored to have brought sugar cane to the Americas on his second voyage. 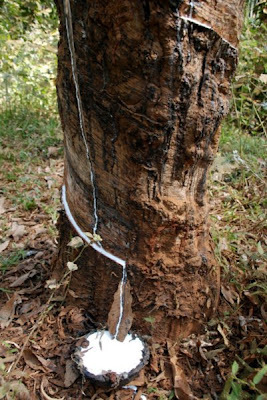 Rubber tree seedlings were smuggled out of Brazil and retooled to maximize yield in Southeast Asia. Great scientists like Charles Darwin and Richard Evans Schultes collected plants throughout South America and brought them home with no concern or consequence. Today, however, we call this biopiracy, and the consequences for taking and using plants from countries are becoming increasingly stiff. The simplified story is this: Many pharmaceutical, cosmetic, and food companies have made millions on plant species that have been used for generations by indigenous groups. Often times, the "discovery" of such money making plants was made by conducting research with the very indigenous groups who had always been using them. Collections are then brought back to corporate, government, or university labs where active ingredients are isolated, products created, and patent claims made - not only on active chemicals or their combinations, but on the plants themselves. The problem here is at least two-fold. Once a patent is granted, indigenous groups can be cited for violation of said patents if they attempt to sell or share some form of those plants - something they may have been using for generations or longer. Second, as can be imagined, the corporate interests stand to make millions and more on their "new" products, without so much as a thank you for the indigenous communities from where those products originated. "For example, a 1995 patent, “Use of Turmeric in Wound Healing,” was cancelled in 1998 after an investigation instituted by India’s Council of Scientific and Industrial Research. The new evidence established that use of turmeric to promote wound healing had been known for generations in India." That's just one ridiculous example of many, and because of examples like this, nations around the globe are increasingly restricting plant collecting within their borders. Gollin details a number of the consequences for biopiracy across the globe, including: loss of profits, blacklisting of researchers, loss of access to materials, and even legal penalties, including jail time and heavy fines. Despite the development of such actions aimed at discouraging the practice, biopiracy is still alive and well. "The seven new cases of suspected bio-piracy in Africa are based on a preliminary study of patent applications lodged and patents granted in the US, EU and elsewhere. Further investigation is merited by African governments, the report states, to determine conclusively whether bio-piracy has occurred and what action to take. The seven cases include claims from universities, government departments as well as small and large companies. The claims relate to a wide range of products including for anti-aging (for example, by luxury goods maker Louis Vuitton under its Christian Dior label), skin-care, sexual dysfunction, viruses and vaccines, insect repellents and possible cancer treatments." In each case detailed by the article, plant species used in traditional medicinal practices throughout Africa." "case involves a patent application by Dicotyledon AG (Sweden) on extracts from Neobeguea mahafalensis, a tree commonly called "handy" which extracts, it claims, have a "sexual enhancing effect" and can be "used for treatment of sexual dysfunction". The report states that Dicotyledon may want to claim it as its own but it has long been used as an aphrodisiac in traditional Malagasy medicine. There is no indication in Dicotyledon's patent application or on its website that it has any intention of sharing its bounty on equitable terms or otherwise. However, the application does make the concession that N. mahafalensis is already used as an aphrodisiac in Malagasy traditional medicine and lists at least eleven citations of traditional use for sexual functions in the scientific literature. The report states that Dicotyledon advances its patent novelty argument by insulting the holders of the knowledge of the plant: "Dicotyledon states that Malagasy traditional healers use so many plants for sexual enhancement that not all of them could possibly work." And further claims that Malagasy healers provide inaccurate information to researchers and that they lack scientific rigour in identifying and characterizing plants. It attacks traditional medicine by asking patent examiners to ignore documented traditional use by stating that "reports on presumed medical effects of plants based on indirect information obtained from local traditional healers and alike is highly unreliable and can't be used in any practical sense for treatment of medical conditions." This example shows that there is a clear attempt to discredit traditional medicinal practices, while using their remedies to develop products for profit. Despite growing international efforts to curb such practices, the offenses continue, allowing the wealthy to continue the pillaging and profiteering off of the poor, a legacy of capitalism that will go down in the annals of history. Wow. I knew this happened, but it's still crazy to see it in black and white. "use of tumeric in wound healing" I couldn't imagine being the patent person that read that one. Seeing that it took an investigation is really sad. You would think that common sense would suggest that someone knew about this for years. The sad part is that people who have practiced these plant techniques for centuries can be cited because of corporations.